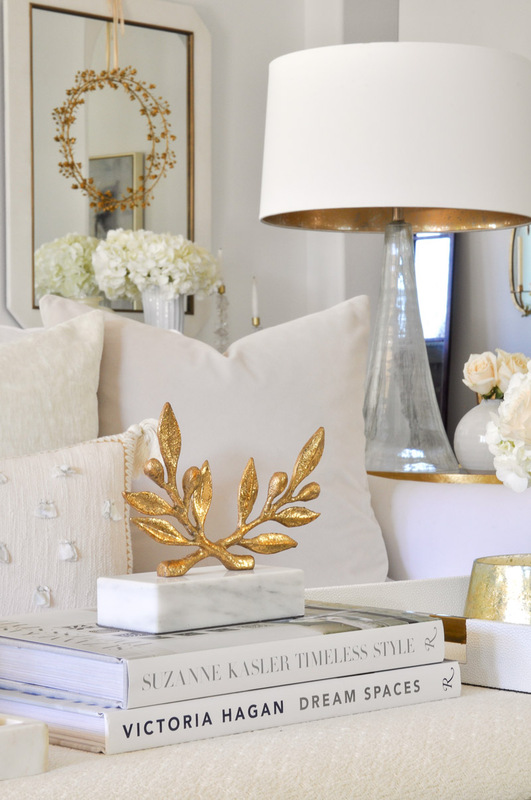 There is something I’ve always loved about home accessories. In fact, if I could spend all of my “decorating” time styling accessories, I would! As a child, I loved to line up my glass animals and other decorative things. Those items have long since been replaced by grown up accessories, but I still consider styling anything decorative pleasureful! Decorative home accessories provide the finishing touches, and the personality to your rooms. They can make a huge impact on a space. 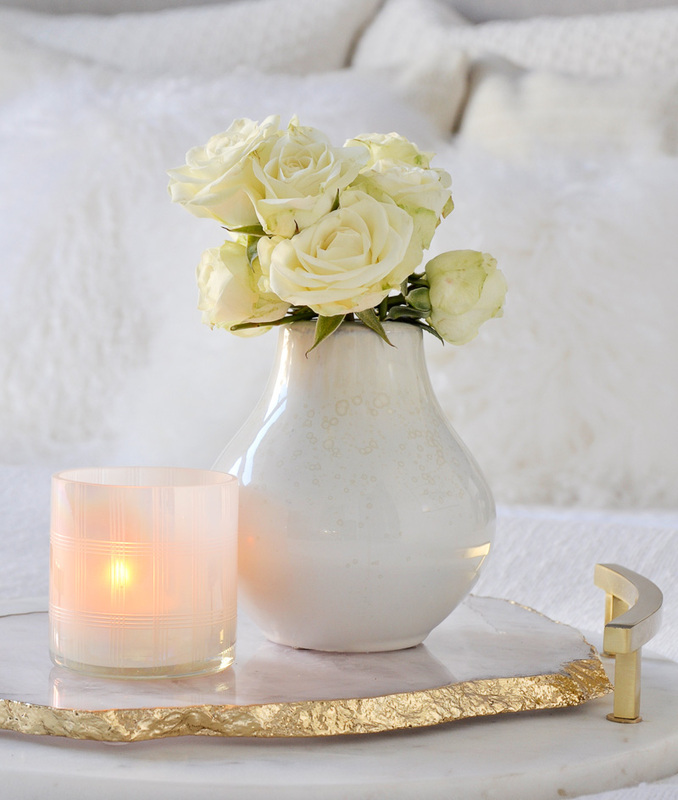 Additionally, home accessories are often the most inexpensive way to give a room a fresh new look. 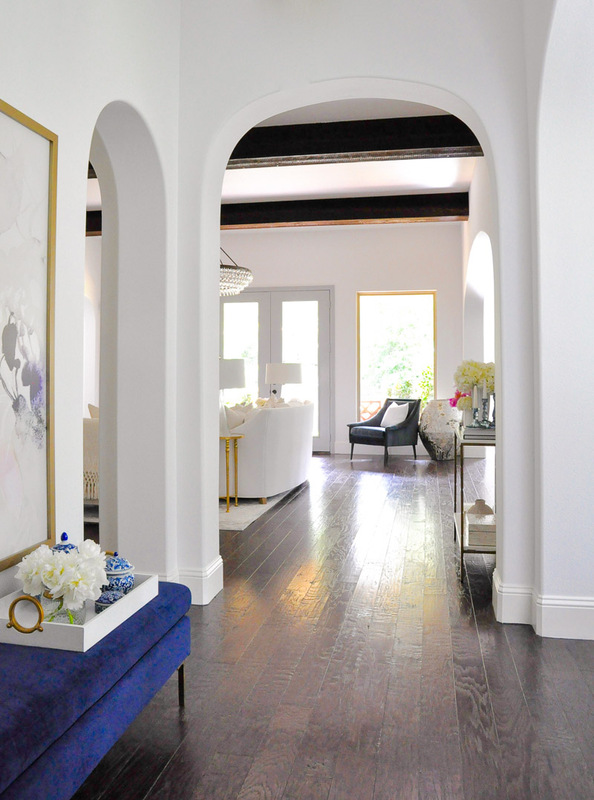 Properly selecting, placing and combining accessories can bring your home a finished look of a designer home. Quality over quantity. I have stuck to this guideline as long as I can remember. It doesn’t mean your accessories have to be expensive. Simply keep an eye out for great values and for nicer items to go on sale. I regularly shoutout home decor sales on Instagram and the LIKEtoKNOWit app if you’d like to follow along. Less is more. Using a few gorgeous, unique accessories is always better than a bunch of knickknacks. Numerous items that are too small make your home look messy. I use my fist as a guideline. If it’s smaller, I don’t buy it. As you layer in your accessories, add your large accessories first. Next add your medium ones, then your smaller ones. Every inch doesn’t need to be filled. Your home will be more beautiful if it is not overly full. *This post contains affiliate links. Disclosure Policy. 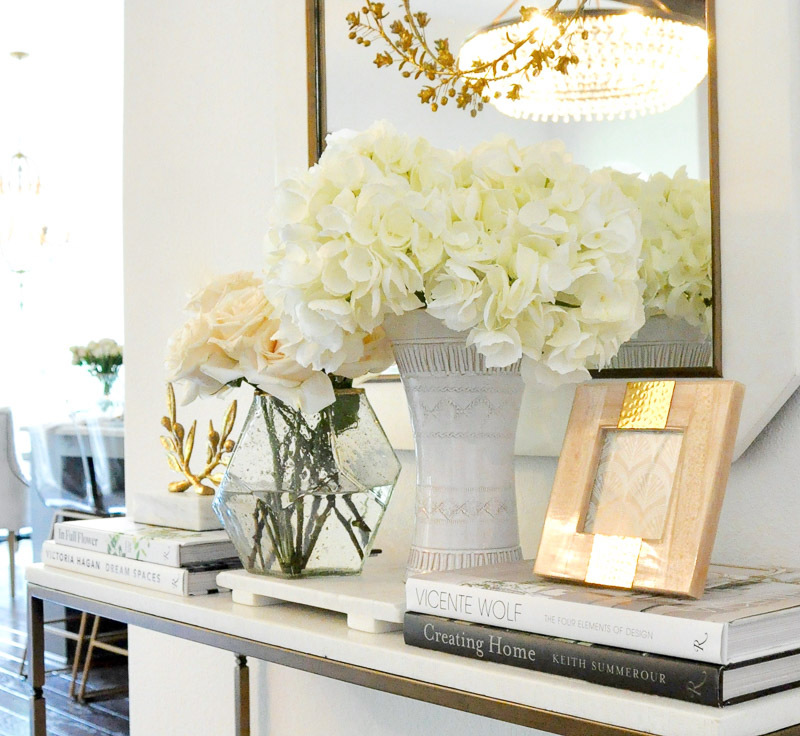 My favorite item for layering and grouping my home accessories is the decorative tray. It defines your collections and provides a more curated look to your decor. Trays are versatile and help your decorative items look more stylish. Vary the heights and textures of your decorative accessories within the tray for interest. Use two matching trays for a great look on a longer surface. 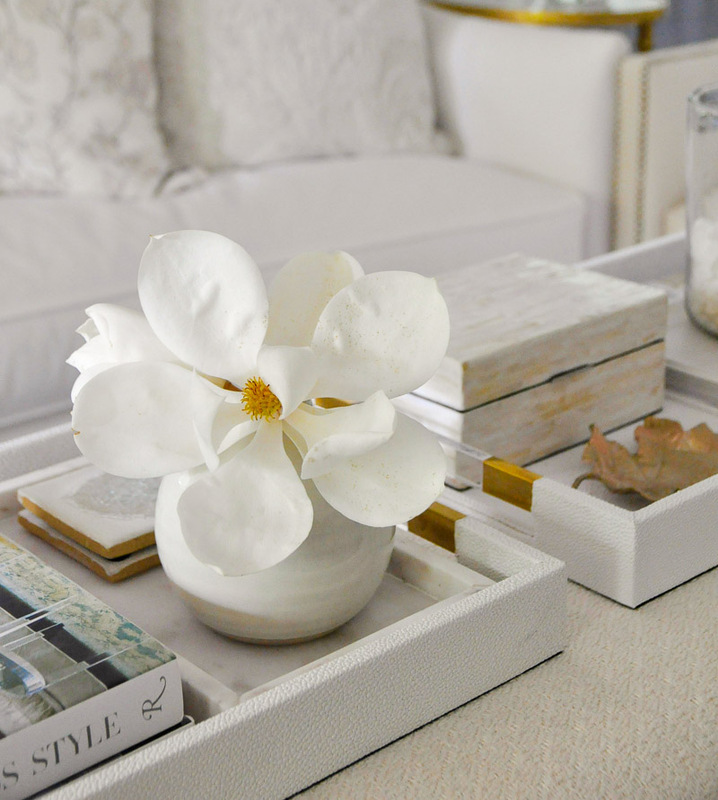 You can use a decorative tray to help tie your spaces together. 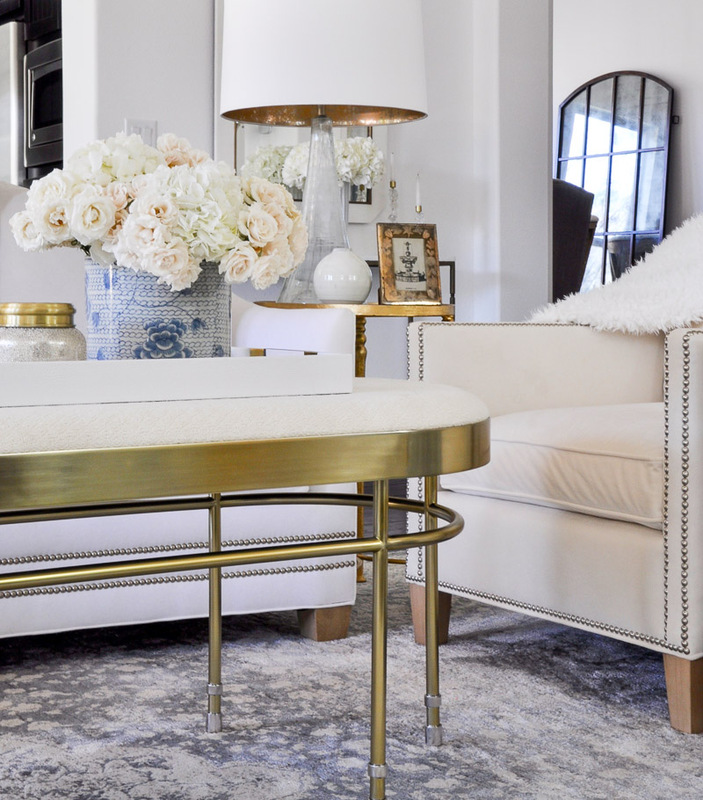 The gold handles on this white tray draw your eye up to the gold frame on the art and forward to the gold framed side table. Similar to decorative trays, a cheese board can be a surface for a chic vignette. Layer one on top of another as I’ve done with this gold rimmed board and the round marble board. You’ll add to the impact of your grouped accessories! Books can be stacked and used as pedestals. 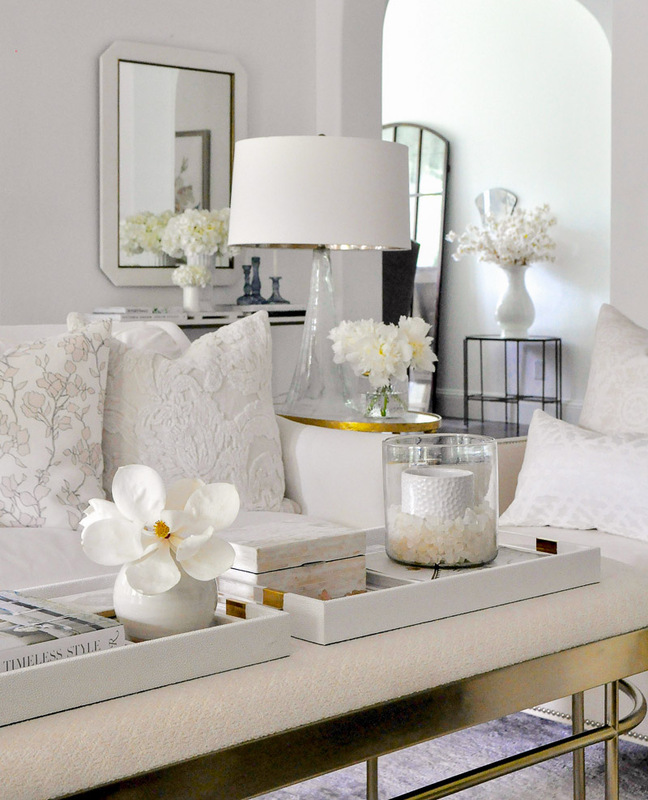 Elevate other home accessories by placing them on one or more coffee table books. When selecting books for your home, it is nice to find a few that compliment your home color scheme. The addition of new home accessories is a great way to add a pops of color! 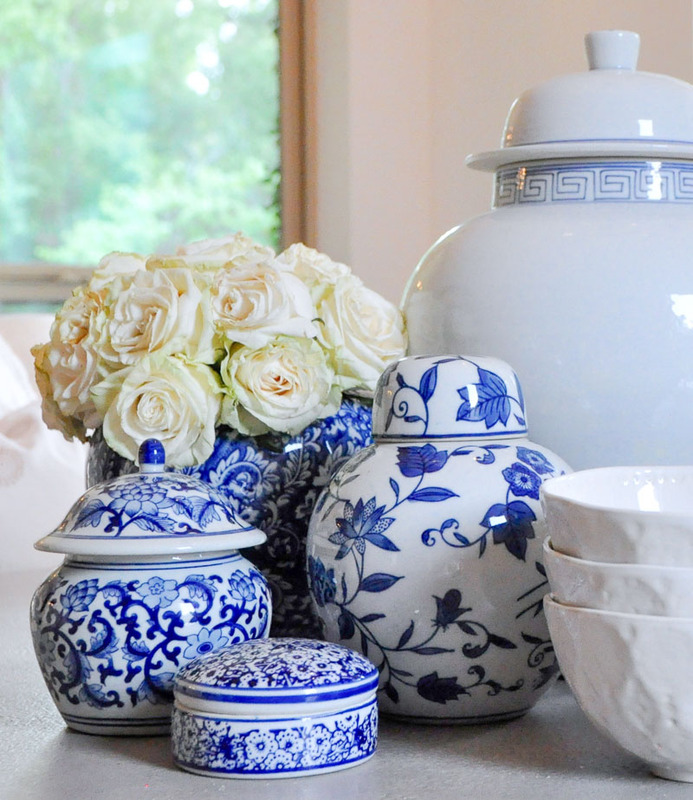 With the surging popularity of blue and white ceramic and porcelain pieces, by adding a small collection, you are adding a timeless look that happens to be very current as well. 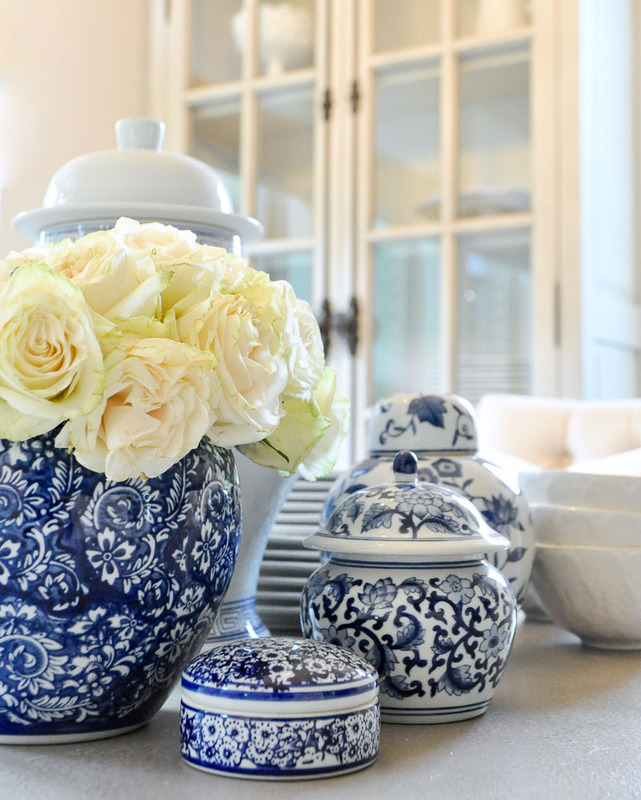 Add a couple of blue and white pieces to create dimension to an otherwise neutral vignette. 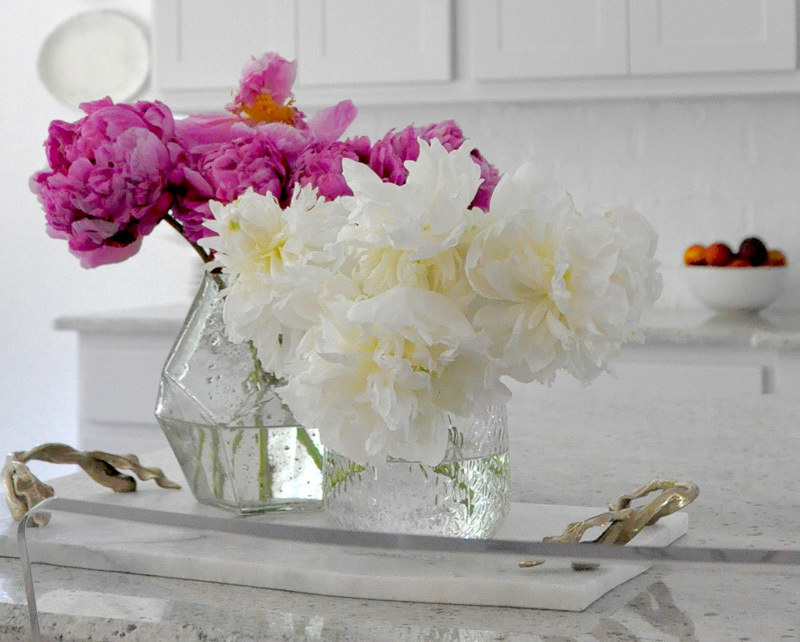 Gone are the days when you had one vase you pull out a few times per year when your husband brings home flowers! Thank goodness! 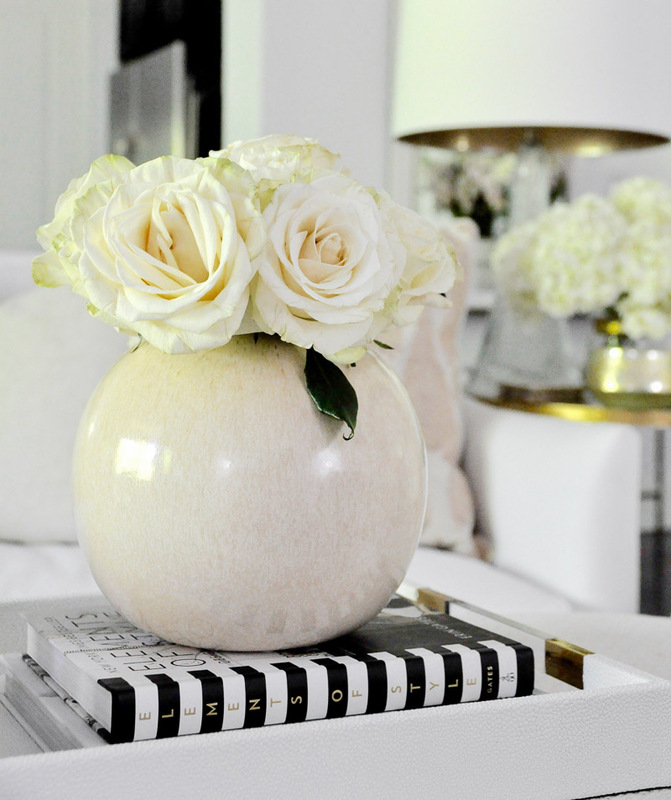 Vases can add character to your home decor, so find a few you love and consider them part of your accessory plan. Clip blooms from your yard or local park (where permitted) so you can enjoy fresh seasonal finds inside. 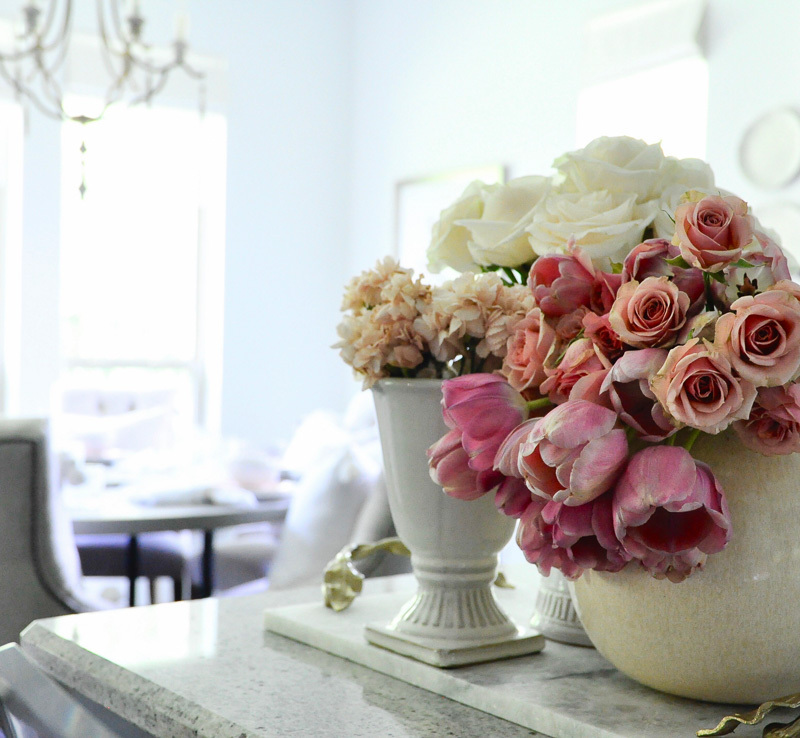 Vases grouped in odd numbers are great for balance, but don’t feel restricted. Two vases full of flowers can be just as effective. 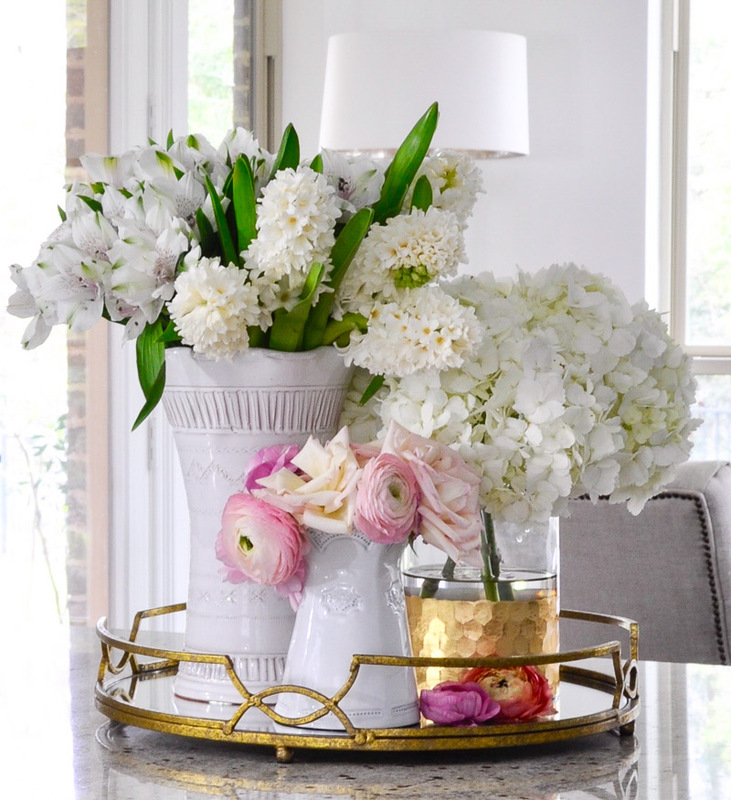 Try grouping vases in shades of white filled with several colors of flowers. Multiple textures and shapes compliment each other. Layered accessories are more interesting and impactful. 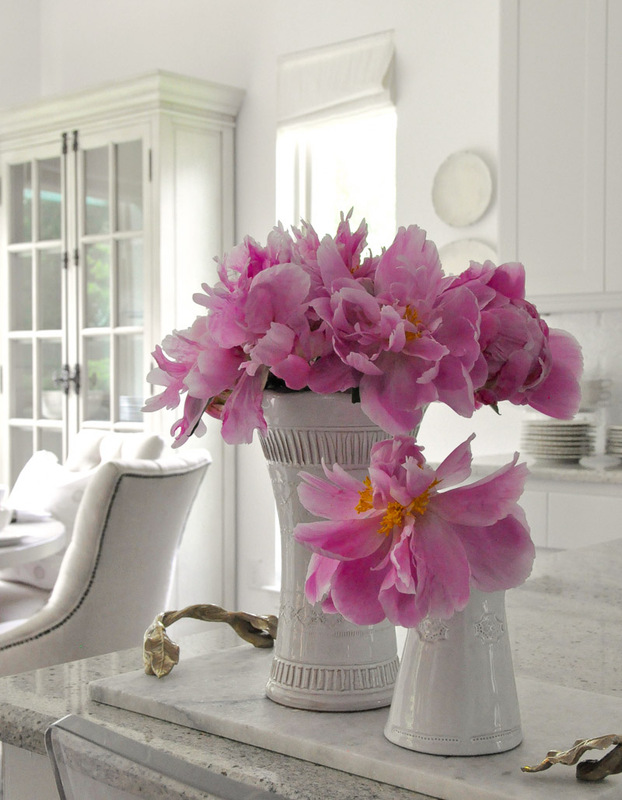 Also, by properly layering, you are adding character that is often seen in magazines and designer homes! 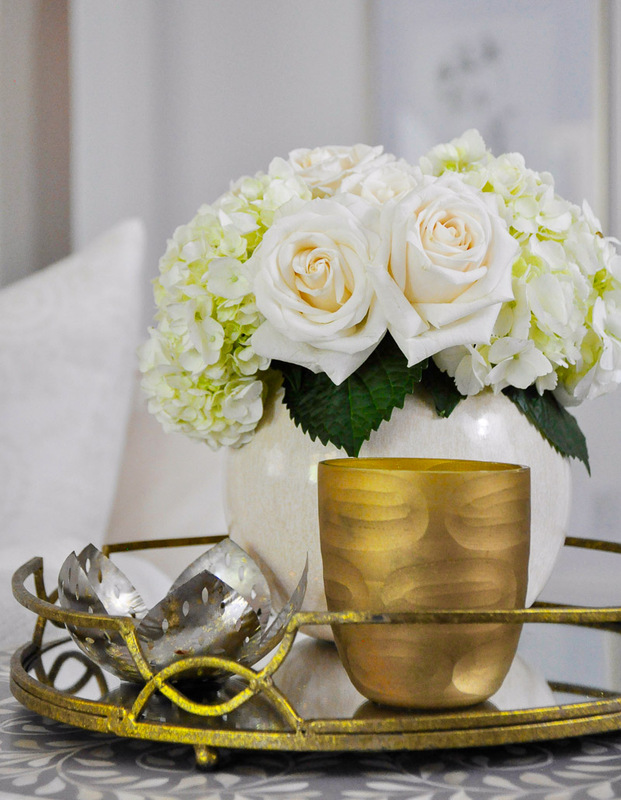 I hope you will practice styling your accessories this way and give your home the wow factor it deserves! 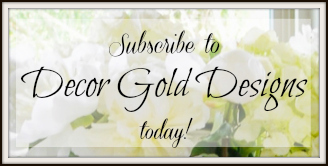 Shop Accessories from our home plus my favorite picks and subscribe to Decor Gold Designs for decorating ideas and tips! WOW! 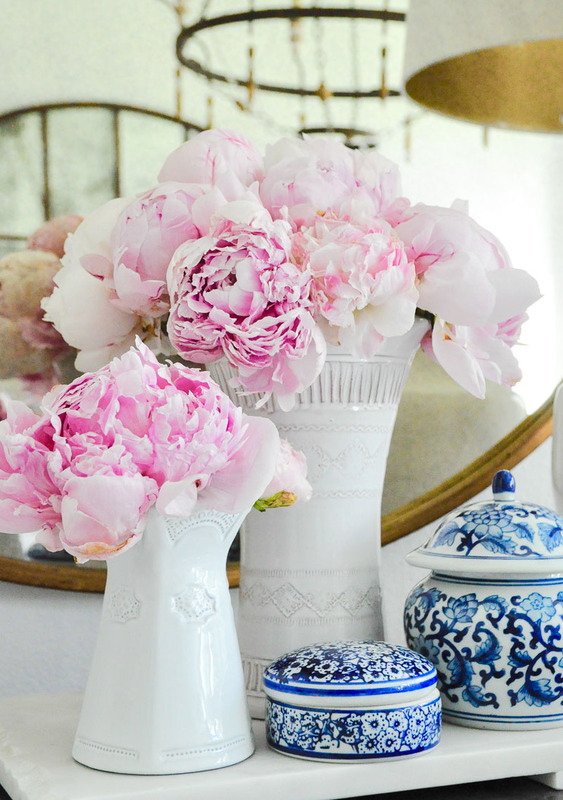 What a stunning post chocked full of beautiful vignettes and ideas. I just had so much fun pinning all of these stunning shots! One of my favorite posts of yours for sure!! Hi Kim, As far as I can tell, it has been discontinued. I linked the last remaining source I found, but like you said, when I checked just now, it no longer works. If I happen to see one for sale anywhere, I’ll follow up again. Sorry!